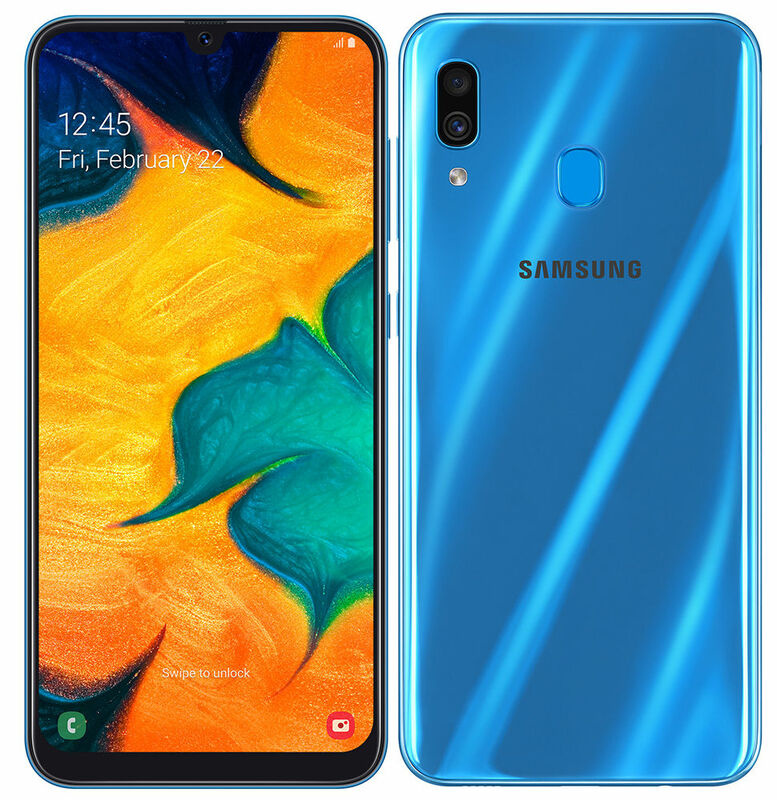 The smartphone Samsung Galaxy A30 sports 6.4-inch Full HD+ Infinity-U Super AMOLED display with the resolution of 2340 x 1080 pixels. It has 4GB RAM, internal storage capacity of 64GB, which can be further expandable up to 512GB via micro SD card slot. It has dual-SIM functionality, dimension of 158.5 x 74.7 x 7.7mm. It has a rear-mounted fingerprint sensor and also features Bixby Home and Bixby Reminder. It is armed with Octa-Core Exynos 7904 14nm processor with Mali-G71 GPU and runs on Android 9.0 (Pie) with Samsung One UI. The camera section of the device Samsung Galaxy A30 includes dual 16MP rear camera with LED flash, f/1.7 aperture, 5MP ultra-wide angle camera with f/2.2 aperture and a front-facing camera of 16MP with f/2.0 aperture. Connectivity wise, it features Dual 4G VoLTE, Wi-Fi 802.11 ac (2.4GHz + 5GHz), Bluetooth 5, GPS + GLONASS, NFC, USB Type-C and supports 3.5mm audio jack, FM Radio. It is backed with 4000mAh battery with fast charging.